Eddie Salazar (8 mo.) R.I.P. 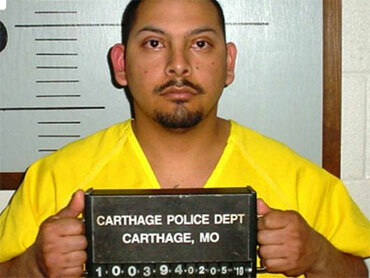 CARTHAGE - A state-wide Amber Alert was issued for an eight-month-old baby named Eddie Salazar. According to the Amber Alert report, two unknown masked men broke into the boy's home while his father was asleep on a couch. He was assaulted and the child was taken. The father was unconscious when his home was ransacked the baby was taken. The incident happened just after 11:30 p.m. Thursday night. There is no description of the alleged abductors. 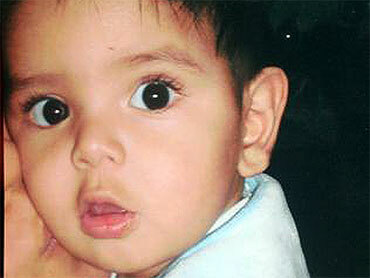 Eddie Salazar Jr., the eight month old child missing since late Thursday night, has likely been found dead. 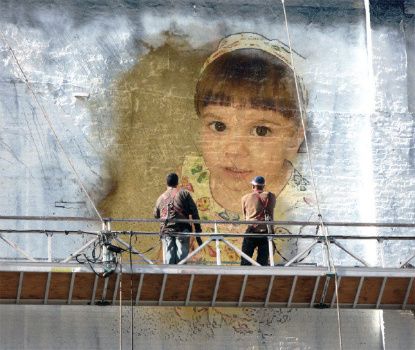 An autopsy will confirm the child's identity and the cause of death. His father is charged with filing a false police report. KSPR's Will Carter has been following this story from the beginning. Everything first came to a close around three this afternoon where I'm standing, along County Road 85. That's where the 8 month old was found, but things really took a twist in this case earlier in the afternoon when police first told us the boy's father had been arrested. Saturday afternoon started with a press conference at two. Carthage Police Chief Greg Dagnan said after hours of foot searches near the Salazar home, things took a turn Friday night when Salazar Sr. named a suspect, who he said took his baby. “We found this suspect that was alleged to have stolen this child, and he was pretty easily cleared of any wrong-doing,” said Chief Dagnan. That meant one thing, Salazar's credibility was now in question. “If someone tells you a story that is believe to be true, and AMBER Alerts are issued, and people all over the state are looking for masked assailants, and we find out that is not true, there's obviously a reason someone has deceived us,” said Chief Dagnan. But that reason wouldn't be known until later Saturday afternoon. Neighbors told us for the last couple of days they didn't know much about the Salazar family because they had only lived at 227 Mound for just a few months. But we learned Saturday that Eddie Salazar Sr. had actually been in trouble with the police on more than one occasion. Salazar Sr. was charged and served jail time for robbery, stalking, and property damage. But what happened Saturday afternoon could add more to that list. After more than 24 hours of searching, his 8-month-old son's body was found in the spring river. “The limb was in the river, and the baby had washed up against the limb in the water,” said Sheriff Archie Dunn. Jasper County Sheriff Archie Dunn said more than two miles of the Spring River were searched after Salazar Sr. spoke with investigators. He said this development would end the search and cancel the AMBER Alert for the child. “I hate to say it's a relief, but we knew there was not going to be a happy outcome to this story. We are relieved that some people in the family can get some closure, and we can wrap this case up,” said Sheriff Dunn. We're told the body of the 8 month old is being sent off for an autopsy at 10:30 Monday morning. We're also told there could be more charges pending for Eddie Salazar Sr., aside from filing a false police report. We're going to bring you the latest details in this developing story as they become available. Law officers are now confirming that the body of a child found this afternoon in Spring River is believed to be that of 8-month-old Eddie Salazar, who was reportedly kidnapped from his home Thursday night at 227 E. Mound St. in Carthage. “The primary suspect in the death of the infact is Eddie Salazar ... the child’s father,” officials said in a statement. Was Baby Eddie Salazar Murdered by His Father or Taken by Masked Men? CARTHAGE, Mo. (CBS/AP) According to his father, 8-month-old Eddie Salazar Jr. was taken by two men wearing all black and ski masks after they broke into the family's home, ransacked the property, and beat the dad unconscious. A police report he filed Thursday led to an Amber Alert. Now, Missouri police say they have found the boy dead, and instead of hunting down the masked intruders, they consider the child's father, Eddie Salazar Sr., the prime suspect in the baby's death. Jasper County Sheriff Archie Dunn said Missouri State Water Patrol officers spotted a lifeless baby wedged against a tree on the bank of the Spring River near Carthage Saturday. Police Chief Greg Dagnan told the Carthage Press that an autopsy scheduled for Monday would confirm the child's identity but that he was almost certain the child was Salazar Jr.
Dagnan announced earlier Saturday that 28-year-old Salazar Sr. had been charged with making a false police report and that he was being held on $100,000 bond in the Carthage City Jail. Dagnan said Salazar Sr. gave police the name of a man he said was one of the people who broke into his home. The Carthage Press reported that police found that person early Saturday and were able to rule that person out as a suspect. "Since Mr. Salazar is charged and is being held on $100,000 bond, that will allow us to do a bit more investigating and do the autopsy before seeking more charges," Dagnan said at a news conference Saturday evening. "I won't speculate at this time what charges we will seek or what will be filed." . Subject: Re: Eddie Salazar (8 mo.) R.I.P.